Meetings and mobility are the key features for the Digital Transformation. 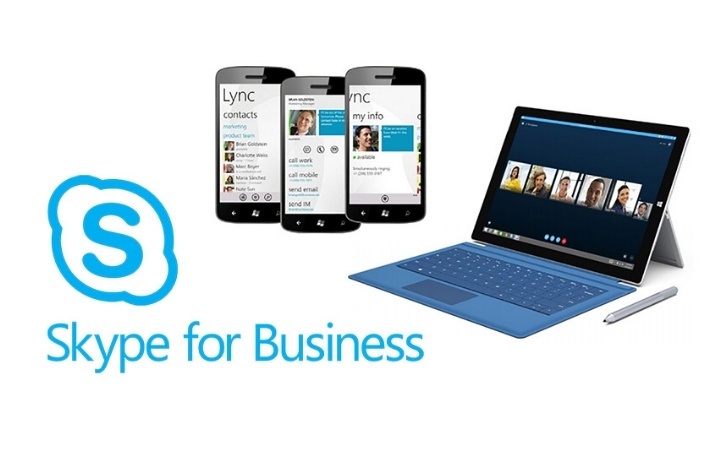 Skype for Business is the solution for every kind of meeting. Audio, video and web conferencing are combined into a one user experience and unified platform. Any place where remote or mobile workers need to connect, present, or conference with others. Situation: “On-the-go” refers to mobile or remote workers who still need to connect with others. Need: You want to look and sound the best whenever and wherever you are connecting with others, conferencing, or giving a broadcasted presentation. 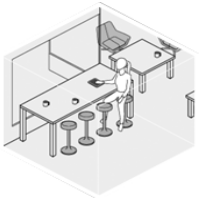 On-the-go users may be in an open space and require some privacy for their conversation. They will want a wireless headset. They may be working from their PC when there are limited conference rooms. Their PC should be equipped with a wired/wireless headset and a webcam. You want to move from one space to another (e.g. from a PC to a Smartphone) during their conversation? You need great quality video to project a professional appearance? 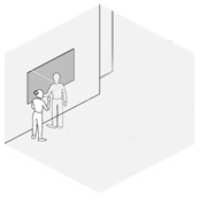 A personal space where presenters can look and sound their best when engaging with remote audiences. Situation: “My Stage” is for office workers at all levels who need to share content. You could be a mobile or remote worker as well. Need: You need an optimal visual experience that allows you to see and present content and each other. You may or may not be in an office, but still need to look and sound their best when interviewing. High-quality video is achieved with a webcam. In an office environment, a conference phone should also be included. On-the-job workers want to share high-quality video of work in progress from their smartphone? 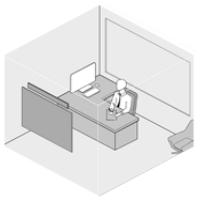 Office workers want to see the reactions of others in real time when they present. In Private or shared offices. In Stage-like arrangements and furniture choices. In Camera-optimised space, colors, or lighting. In Space that accommodates conversation geometry. These Skype for Business meeting solutions provide that capability. A place for impromptu/rich collaboration and staying connected without leaving remote people behind. Situation: “Huddle” refers to a place where office workers tend to meet that isn’t a formal conference room. Need: Those people need to connect with others, often impromptu or informally. They don’t necessarily need to present content. Meeting rooms should be equipped with an audio/video solution like a conference phone and a 360-degree webcam. When no meeting room is available, a small conference room or huddle space should include a conference phone. They want to move an impromptu conversation in progress into a conference room? They want to extend the conversation to remote participants? Situation: The “NetGen Conference Room” is for office workers in dispersed teams who need to work together on projects. Need: Connection and interaction should happen effortlessly and naturally. 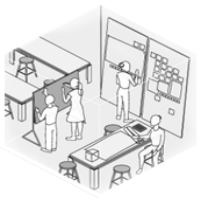 Employees need to brainstorm, generate, and iterate in small or large groups? Employees in multiple locations all want to review and edit presentations at the same time? Furniture that moves for changing orientation. The public space where anyone can share, discover ideas, make timely connections and just have some fun. Situation: “The Vibe” is for groups who want to share content in a public space, such as a lobby or auditorium. Need: Anyone can access and engage with the content without having to enter log-in credentials. Public spaces should be equipped with a visual device such as a Surface Hub or touch-screen monitor. The content is what creates “the vibe” of the space. 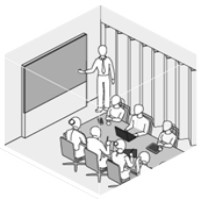 In an auditorium setting, a Skype for Business Room System makes sharing content and seeing the presenter or attendees simultaneously possible. People and groups had a place to share their work and knowledge with the greater organization? Our cafes and walls offered serendipitous encounters with who we are and what we’re working on? Where information is broadcast or exchanged amongst a large group. Situation: “The Auditorium” is for public presenters or and large audiences who wish to exchange or collaborate on content. Need: These people may be communicating an idea company wide, or may need to engage in two-way communication with a broad audience. 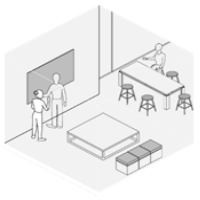 The audience space should be equipped with a visual device such as a Surface Hub if white boarding and collaborating on content is desired. In spaces such as an auditorium where attendees will have their own laptops, a monitor enables attendees to see the content iteration and each other. Employees want to integrate individual output into shared output? A public workshop to collaborate needs to include remote attendees?